Working on success in your career, education, life, relationships, or happiness takes a lot of work and comes with a lot of stress; however, often the last thing we put our attention or focus is on our own health and peace of mind! In business, an “asset” is defined as a “resource that an individual or company owns and is the source of economic value with the expectation that it will provide future benefits.” We are our most important asset contributing to a successful and happy life! And if we don’t “Take Care of the Asset”, our bodies and minds will get your attention through illness, injury, fatigue, lack of motivation, depression, or even death! Responding to special requests from Vital Japan members, Roger will share the secrets of how to find and develop successful relationship partners. You might be surprised at this approach to attracting the right people into your life! You can’t be successful in your professional career or personal life if you don’t take Extreme care of the Asset! And you can apply these same lessons to improve your team leadership as well! Be prepared for some new ideas and ways of thinking about your life! Roger is an Executive Coach who works with top level corporate leaders in Japan; consults in Leadership Development; and also privately coaches globally minded professionals such as Vital Japan participants. He holds an M.B.A. from Hitotsubashi University & London Business School, and is currently pursuing a Master’s of Science in Leadership, Organizational Development, & Executive Coaching through the University of Texas at Dallas. Roger recently retired from a global career as a U.S. Army Officer as a Regional Intelligence Analyst working in Japan, the U.K., Belgium, and Hawaii. He can also be seen around Tokyo as the lead vocalist and guitarist for his band, The Boso Boys! 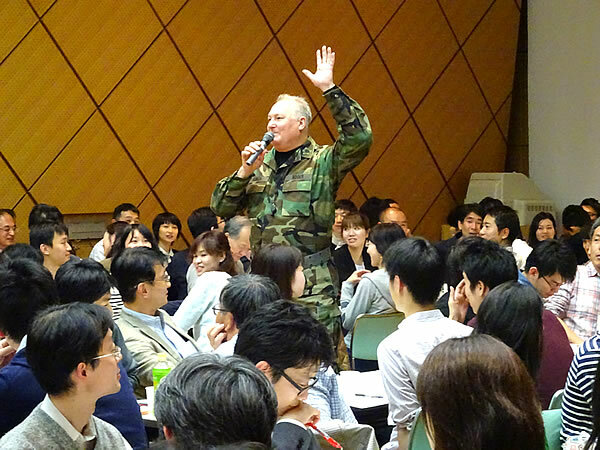 Following on the popularity of his Leadership Lessons from the U.S. Army, Executive Coach and Leadership Development specialist, Roger Sherrin, returns to Vital Japan for another unique presentation full of practical take-home techniques to improve your life and career!